After launching an elaborate teaser campaign in the past few days leading up to the 89th Edition of the Geneva Motor Show, Tata Motors has certainly grabbed all eyeballs with the unveiling of its future passenger vehicle product portfolio. After the successful launch of the Harrier in January, Tata Motors has introduced the Buzzard (H7X) as a 7-seater version of the Harrier. Both the Harrier and Buzzard share Tata's all-new OMEGARC platform which has been inspired by Land Rover's D8 architecture. To accommodate the third row, the Buzzard's length has been increased by about 62mm. To keep onlookers from getting confused between the two models, the Buzzard will get larger, 18-inch alloys and possibly roof rails as well. Engine-wise, the Buzzard is likely to get a more powerful version of the same 2.0-litre Kryotec diesel motor found in the Harrier, along with a six-speed automatic gearbox option as well. The Buzzard Sport, on the other hand, is the Euro-spec version of the Harrier sold here. It features multiple exterior changes for global markets. Just a few days back we had brought you teasers of Tata's upcoming premium hatchback. In fact, the name 'Altroz' too had been announced simultaneously. Well, here's the first look at the production-spec model. You can read more about the Altroz' underpinnings and engine options here. When launched in India, it will go up against established rivals like the Honda Jazz and the Hyundai i20. After the launch of the standard Altroz, Tata will follow it up with the launch of an electric version as well. 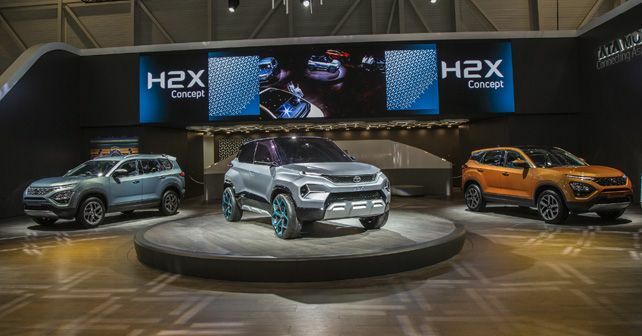 The H2X Concept gives us a clear idea of how its production-spec sibling, the Hornbill, will look like when it makes its debut in 2020. For now, all we know is that it has been designed using Tata's Impact 2.0 Design philosophy and draws its inspiration from the H5X, the Concept on which the Harrier is based. When launched here, it will slot just below the Nexon and will be built on Tata's ALFA modular platform, the same as the Altroz. *The 'Buzzard' product name has been specifically coined for GIMS 2019 only. The christening of the production version of the vehicle in India will be announced closer to the commercial launch.